#ROHMorgen last night was transcendent. Something so moving, so human. What did you think of Morgen und Abend? Let us know via the comments below. Morgen und Abend runs until 28 November 2015. Tickets are still available. 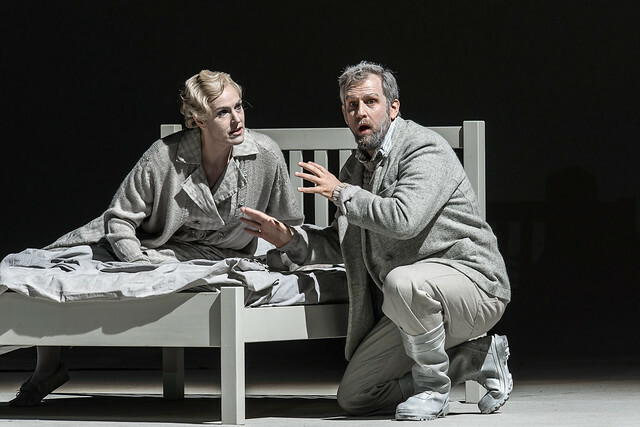 The production is a co-commission and co-production with Deutsche Oper Berlin and is generously supported by Stefan Sten Olsson, Cockayne - Grants for the Arts via The London Community Foundation, Ernst von Siemens Music Foundation and The John S Cohen Foundation. A little slow to get going; I thought the first section with the (very clearly) spoken words lasted a bit long but after that absolutely gripping. Terrific staging (moving furniture a little reminiscent of Glyndebourne Makropoulos but none the worse for that) and great singing, particularly from Pohl and Wegener, and playing. Glad I came to the Insight evening first. Well done for putting this on and looking forward to the next 7 new operas. I didn't like the beginning. The spoken part was too long and the music took me some getting used to. I loved the transition to singing with beautiful voices supported by expressionist music. I loved the story and the non-communication between the living and the dead. I was strangely transfixed by something I didn't like at the beginning. It still makes me think. The stage set was very fitting to the music. I personally thought this Opera was lacking. As a seasoned Opera goer I found it boring, very slow moving and the dialogue terrible. I regret spending money and time on this show as it did not bring anything new. It was a very basic concept with very low and slow development. Amazing and brillant performance, thank you very much for this world Premiere so fantastic ! 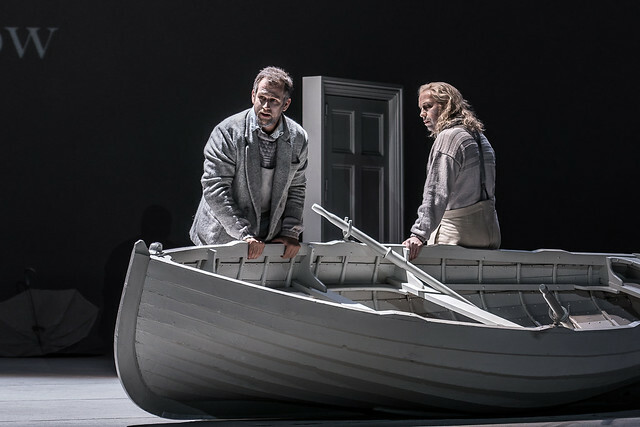 Whatever one may think of "Morgen und Abend" (and after having been present last Friday, I can understand the range of views expressed ,as it IS such a puzzling work), I do think the Royal Opera deserve full credit (a) for putting this opera on and (b) for making such a success of its actual performance. It's gratifying to know that there will be several new operas staged over the next few years...and I,for one, am happy to see umpteen scheduled performances of "Traviatas,Carmens etc...: (after all,you don't HAVE to go) if the result is a refreshing stream of new works. And,to be sure,they won't all be winners. But I would encourage real opera fans,as opposed to canary-fanciers, to try this one. You may not like it...but it is stimulating and wonderfully well done. And special congratulations to our own orchestra, whose skill in absorbing new material and style is second to none. An opera which only lasts 90 minutes where no one sings for the first 35 minutes is not an opera! Wonderful performances and production but ruined by a libretto of total banality pretending to be deep and meaningful. All around me the audience was bored stiff and very many refused to clap at all at the end. First 20 mins really hard to understand, alas - bad amplification (row 9 of Stalls). Heavy-going. Felt like it was in real time. Hats off to singers though. A very atmospheric piece of theatre, with a fabulous cast of five performers. Great use of narrative and singing and a minimalistic setting created with lovely greys and whites. Could this be what happens in the afterlife? A must for anyone who loves theatre and an interest in a very sensitive subject. Well done to the entire cast and production team. Dificult to understand for noobs... The experience didn't worth it. Very good and interesting, however death might be a pleasant even jolly reunion, fingers crossed. Wonderfully stimulating and terrifically done! Let us have it in ALL the major Houses ASAP and Opus Arte released soonest! I felt that it was an oratorio masquerading as an opera. The music was very fine - the singing and the playing likewise - but the stage was empty. Without drama the stage is a distraction. But I can imagine it in a concert hall. 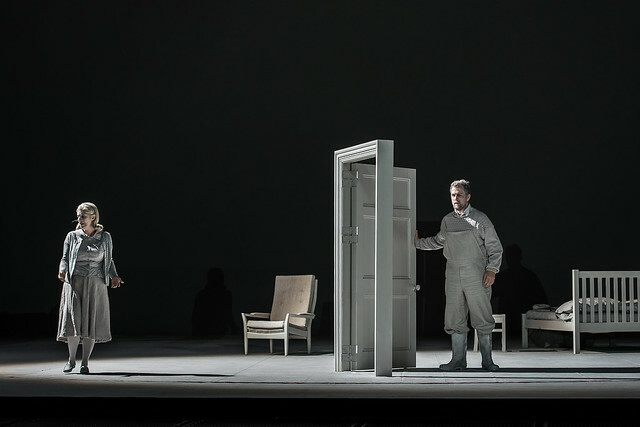 It would better suit a semi-staged environment where each member of the audience can set the piece in their own imagination and the singers would not have to try to act when there is nothing to do. Rather the words could be the passing thoughts of the characters. (It would be great opening night to the Proms). Like other contributors I was unconvinced by the acting in the context of the opera. Brandauer's attempt to make the part work was heroic - but what can you do with lines like "It's so quiet & etc" when the piece opens with a volley on the kettle drums, a celestial chorus and a full orchestra pitching in for the hell of it? Whatever it's merits as a play, filleted into an the form of an opera libretto the text predeceased Johannes by about 90 minutes. It was a brave piece to put on and seems to have been pretty well received, but I think - if we forgive the text - it will be more likely to last outside the opera house than in it. I am afraid that we are not in the presence of an opera. And despite the 'classification, that we may agree, it's worth to see it. Once. It has to be noted that I have no musical education and I just love the Opera/music theatre. I found it pretentious and banal in its premises Death/Cold, Death/cold hand, Death/dust no colour, Dying/bright Light. I am refraining from commenting the music based on the fact that I am a simple spectator but I found it -in its attempt to avoid melodies and harmonies- equally banal and not original. BUT Christoph Pohl's performance duplicates the value of the ticket. He was absolutely amazing. I just wanted to stay in my seat and wait for him to play Scarpia and bring my brain back to life. Also set design was very elegant and beautiful. Very moving and very much a human experience. We loved every minute - the narrated beginning seemed to puzzle people quite often, but it made perfect sense to me. The movement from morning to evening of life was perfectly encapsulated and the performances were stunning. The staging was perfect. Why cannot I attend this opera it seems amazing? Why only a few performances?